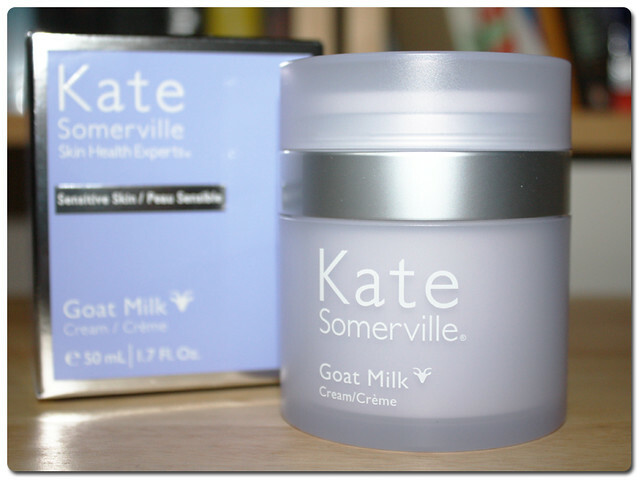 The Goat Milk Face Cream by Kate Somerville is a bit of a cult skincare product. You know how it begins, there are whispers about it from the pro's singing its praises but not too loudly because it is oh so difficult to get hold of and is super pricey, and then the really clued up followers pass on the message via YouTube or their blogs as they give it a go and stamp their approval all over it, and eventually it trickles down to little old me, searching for a new night cream and fancying a bit of something special. I first heard of this through Caroline Hirons, and then through Anna of Vivianna, and after two big endorsements for the cream, and the news that it could now be shipped to the UK I went searching for more info. I wanted to know what was supposed to make it so good! When I went over to the Kate Somerville website I wasn't disappointed, the product sounded like it was perfect for my recovering from acne abused skin, it talked of being restorative and gentle, while also using lactic acid to get rid of any rubbish while maintaining pH balance (something I am striving hard for at the moment). I popped it into my basket, hit purchase, and thought nothing more of it. This is when the problems started. First, I didn't get a the little despatch notice I was expecting within a few days, I thought oh maybe they don't do them, but I could really do with knowing when it will be here what with it being international. Time passed (almost a whole month) and I hadn't had a dispatch email, but I did get an email asking how I had liked my product, which I hadn't received yet. I sent an email off to them asking where it was as they clearly thought I should have it by now, and I was told it was en route to the UK, but that it was only just on its way because they had been restocking. I was never notified that they had been restocking or that there would be any delay. Great! I thought, it is on its way, it will be here soon, a bit late but better than never. The little pot of loveliness made it fine from the west to the east coast of the USA, and swam over the Atlantic alright too, but when it hit British shores I started to have trouble. Kate Somerville had missed a whole line out of my address, a whole line, that line had my village on it. My pot of face cream very nearly went on someone else's face in the next town over. That second line is verrrry important around here. My address was inputted perfectly on the website, and on my order details, but not on the label. I at first thought it was the delivery company, but when I finally got hold of the package, the address had been transcribed incorrectly on the invoice too. I had to alert the delivery depot to the problem when I spotted they had apparently "attempted delivery" but there was no card at my house, it was a bit of a palaver. When I alerted Kate Somerville to this new issue, I was told there was an issue with their system, and they offered a $25 gift card to make up for all the hassle I had had to deal with, I thought this was pretty reasonable and at that point I was pretty OK with things. That was the beginning of November and I hope they are a bit ashamed that I now have to say that it was only when I emailed them a few days ago to ask where the gift was that it materialised. Overall my opinion of their customer service is that it is pretty poor. Throughout the whole process I have felt like an after thought, almost as if they aren't bothered about reaching out to the UK. So what about the actual cream? Was it worth the hassle? It is hard to judge this, because I am using a routine which is pretty good for my skin anyway at the moment, but I would say that this is a good product. It keeps me hydrated but I do think it is a little light, my skin feels like it could drink some more of this in after maybe an hour of wearing it so it is maybe better suited to being a day cream only for me. I have had a reduction in blemishes recently, and although I can't attribute this solely to the cream I imagine it is a contributing factor, it definitely helps reduce redness though and is cooling and calming meaning I wake up fresh faced instead of puffy. The packaging is wonderful, it has a pump that is ridiculously difficult to photograph because the whole top of the pot is the actual pump, but it makes for a really efficient and clean dispensing solution which I was really impressed by. I like the aesthetics of the design too, the matte finish and light pastel shades. I want to make it clear that I really wanted to love this product, and maybe if I had had a bit of a better experience with the company I would think it was worth the hassle, but honestly I just don't know that I would bother again. I love the effect on my skin that this has in conjunction with my other products but I don't think that it is so life changing that I would consider buying directly again and paying full price, which is a shame as I believe that since they have begun shipping directly the product is no longer available through other UK based suppliers. I will probably re-stock using the gift voucher they sent me, but I shall be doing so well before my current pot runs out just in case it all happens again! This is a really conflicted review I know, but I have always said I want to be completely honest when it comes to reviews and I think it is important to share the bad and the good. Do you have any nightmare stories regarding overseas shipping?